Photographer Hans van den Bogaard was recently commissioned by the Amsterdam Academic Medical Center (AMC) to photograph part of the Vrolik collection. This 19th century collection consists of over five thousand anatomical, pathological-anatomical, zoological and teratological specimen. Van den Bogaard’s photographs are currently on display at photography museum Foam. Last week, we took our guest Andrew Sempere (MIT-based designer, curator, artist) to see the intriguing and also unsettling exhibition. The Vrolik collection was originally privately owned by Professor Gerardus Vrolik (1775-1859) and his son Professor Willem Vrolik (1801-1863). It was the last collection of its kind in the Netherlands. Increasing specialization in science and medicine decreased the need for a collection that covered the very broad spectrum of comparative normal and pathological anatomy. Six years after Willem Vrolik passed away in 1863, an Amsterdam citizens committee acquired the entire collection. It was handed over to the Athenaeum Illustre, the predecessor of the University of Amsterdam. Today, the collection is housed at the AMC. On the Foam website, we read that Van den Bogaard’s assignment “was not just to document the collection, but to visualise it in a much freer manner. (…) The result transcends traditional scientific photography in which the medium primarily serves a specific branch of science. Van den Bogaard has succeeded in creating many photos which fascinate not only because of what they depict, but because of how the specimen is depicted. The specific use of both natural and artificial light, his choice of a particular camera and special lens and his well-considered use of the blue background in photographing many of the specimens ensure that the photos far surpass the straightforward recording of a collection.” A similar text was displayed at the beginnig of the exhibition. We therefore entered the exhibition space with this specific ‘artistic’ mind-set. Personally, I came across a lot of photographs of anatomical specimen when I was working on my dissertatio n on brain imaging. I thought I was used to dealing with the discomfort one may feel in not knowing if consent was given to anatomists for using the human remains. I thought I was used to these kinds of images, also to more aesthetic ones. I guess I was wrong. I found it to be quite an unsettling experience to look at these aestheticized photographs of anatomical preparations, ranging from parts of the human face to anencephalic fetuses, and to find beauty in the womb of a chicken, for instance (image on the right). Considering the long history of anatomical imaging, using an artistic eye for the purposes of clinical, medical-scientific documentation has from the mid-19th century onwards become much less common. But Van den Bogaard’s photographs fit well with an earlier tradition of anatomical display, dating back as far as the Renaissance. One of the most famous examples is Andreas Vesalius’ spectacular folio of the human anatomy, De Humani Corporis Fabrica, published in 1543. In Vesalius’s day, the beauty of the images was seen as an essential part of achieving accuracy. In the Netherlands, the 17th century anatomist Frederic Ruysch is still well-known for his artful anatomical museum. 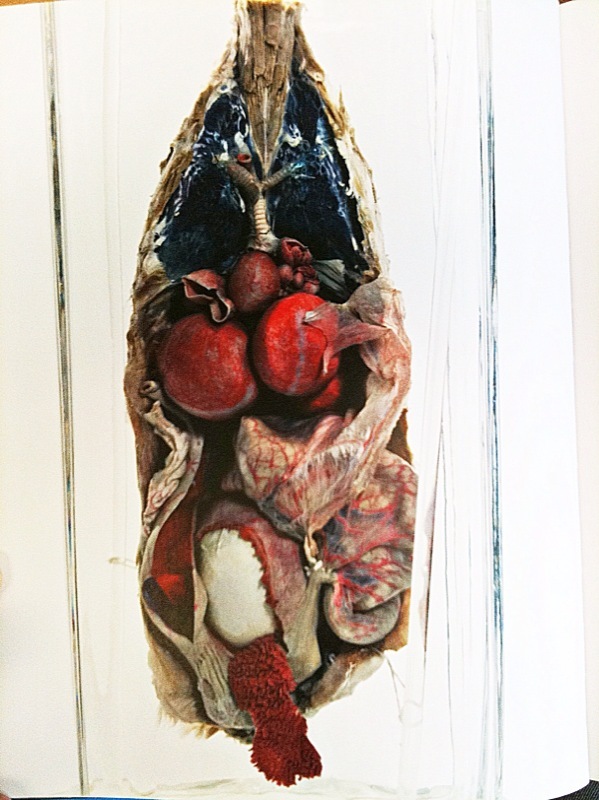 Ruysch preferably displayed his specimen in separate cabinets, each displaying a separate anatomical still life, a nature morte (Luuc Kooijmans, De Doodskunstenaar, Bert Bakker Publishers, 2004). Quite similarly, Van den Bogaard’s photographs can also be seen as timeless memento mori‘s. In some ways, the move of the Vrolik collection from the academic hospital to the white walls of a gallery is less successful. Van den Bogaard’s aesthetic photographs are accompanied by captions with very dry descriptive medical information, revealing the fact that the exhibition was commissioned by the academic hospital. This has a very disquieting effect. Medical-anatomical information is prioritized over, for instance, background information on the photographer’s artistic and technological choices. I considered this to be a missed opportunity to build bridges between the two poles, and resorted to the web to find more information on Van den Bogaard’s take on the exhibition. Luckily, Radio 6’s De Avonden aired an interview with the photographer on May 6. On the other hand, this type of photography and captions might actually fit quite well with the long-standing tradition of anatomical display I was referring to above. As said, the combination of artistic visualization and anatomical description was much more common in Vesalius’ and Ruysch’ days. Moreover, it was also quite customary for scholars to look for ways in which to disciplineartists.